Though Christmas is in the past we're not gonna leave you with any best music pieces missed out of our spot! 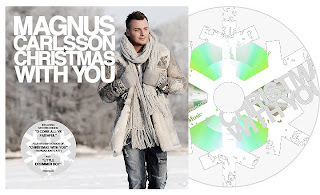 Magnus Carlsson is one of those artists having huge colection of Christmas covers who just can't leave audience without December tours and music gifts in cold period. This year wasn't exception and Magnus has presented (in a wrap with Christmas tour-programme) his track "Christmas With You" from "Änglarnas Tid" album as separate single packed with it's Spanish version "Navidad Junto A Ti", another old track "Little Drummer Boy" and new recorded version of "O Come All Ye Faithful". The most pleasant in "Christmas With You" is that having traditional Christmas feeling this track is generously disco-powdered schlager in all its classic brilliance with key-change and everything, it can't go other way with ex-Alcazar member, isn't? And it's lovely! Below you can check this track in studio-version and to watch it performed in acoustic at Nyhetsmorgon. Christmas still continues at Swedish Stereo! Amazing. I love it. Magnus is one of the best artists for churning out Christmas goodness :) Up there with Mariah and Amy Grant!